Bumblebee is a 2018 American science fiction action film centered on the Transformers character of the same name. It is the sixth installment of the live-action Transformers film series and serves as a reboot of the franchise. Directed by Travis Knight and written by Christina Hodson, the film stars Hailee Steinfeld, John Cena, Jorge Lendeborg Jr., John Ortiz, Jason Drucker, and Pamela Adlon, with Dylan O'Brien, Angela Bassett, Justin Theroux, and Peter Cullen in voice roles. It is the first live-action Transformers film not to be directed by Michael Bay, though he still produced, and Travis Knight's first live-action film. Principal photography on the film began on July 31, 2017, in Los Angeles and San Francisco, California. Bumblebee premiered in Berlin on December 3, 2018, was theatrically released in the United States on December 21, 2018, and has grossed over $459 million worldwide. The film received positive reviews from critics, who praised the action and Steinfeld's performance, as well as the 1980s setting and sense of nostalgia, with many calling it the best installment of the Transformers franchise. On Cybertron, the Autobot resistance led by Optimus Prime, are on the verge of losing the civil war against the Decepticons and prepare to evacuate the planet. A Decepticon force, led by Soundwave, Shockwave and Starscream, intercepts them during the evacuation, and Optimus sends Autobot scout B-127 to Earth on an escape pod in order to set up a base of operations where the Autobots can regroup. In 1987, B-127 reaches Earth alone, crash-landing in California and disrupting a training exercise by Sector 7, a secret government agency that monitors extraterrestrial activity on Earth. Colonel Jack Burns presumes B-127 to be a hostile invader and attacks him. B-127 scans a Willys MB Jeep and flees into the forest, where Blitzwing, a Decepticon scout, ambushes him. When B-127 refuses to reveal Optimus's whereabouts, Blitzwing tears out his voice box and damages his memory core; despite this, B-127 stabs and kills him with one of his own missiles. Before collapsing from his injuries, B-127 scans a nearby 1967 Volkswagen Beetle. Meanwhile, teenage girl Charlie Watson remains traumatized by the death of her father, and resentful of her mother Sally for finding a new boyfriend named Ron. Charlie finds a yellow Volkswagen Beetle in a scrapyard belonging to Hank, who gives it to her as an 18th birthday present. When trying to start it, Charlie unknowingly activates a homing signal that is detected by Decepticons Shatter and Dropkick as they interrogate and execute the Autobot Cliffjumper on one of Saturn's moons. The pair heads to Earth, where they gain Earth vehicle forms and pretend to be peacekeepers, persuading Dr. Powell and the rest of Sector 7, despite Burns's disagreement, to help them find and capture B-127, whom they claim is a fugitive and a traitor. While Charlie attempts to fix the Beetle, it transforms into B-127, whom she befriends and nicknames "Bumblebee". She then unknowingly unlocks a message from Optimus urging Bumblebee to defend Earth in their absence, which restores some of his memories. Bumblebee is discovered by Charlie's neighbor Memo, who agrees to protect their secret due to his feelings for Charlie. Left alone, Bumblebee accidentally destroys Charlie’s home and causes an energy spike that attracts Sector 7’s attention. When Sally blames Charlie for the destruction, Charlie finally expresses her pain over her father’s death and angrily leaves with Bumblebee and Memo, only to be intercepted by Sector 7 and the Decepticons. Bumblebee is captured while Charlie and Memo are returned home. Charlie convinces her brother Otis to cover for her and Memo as they follow Burns to the Sector 7 outpost where Bumblebee is being held. Shatter and Dropkick torture Bumblebee into revealing the Autobots’ whereabouts, discovering that the Autobots are coming to Earth. They leave him for dead after revealing their plan to bring the Decepticons to Earth. After alerting Burns to the truth about the Decepticons, Dr. Powell is killed by Dropkick. Charlie electroshocks Bumblebee back to life, restoring his memories. After fighting past Burns' obstruction and attempt to re-secure Bumblebee with the help of Memo, Sally, Ron, and Otis, Charlie and Bumblebee set out to prevent Shatter and Dropkick from contacting the Decepticons using a radio tower at a nearby harbor. Burns also intervenes and defends Charlie. His helicopter is shot down by Shatter, but Burns is saved by Bumblebee. While Bumblebee fights Dropkick, he binds him with a chain, entangling his systems when he transforms and Bumblebee rips him apart. Charlie deactivates the Decepticon beacon, causing an enraged Shatter to pursue her. Bumblebee destroys a dam wall, triggering a flood that causes a cargo ship to crush and kill Shatter. Burns, having a change of heart and grateful towards Bumblebee, gives him and Charlie time to escape before the army arrives. 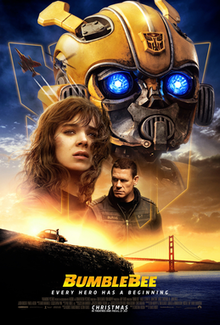 Charlie and Bumblebee arrive on a cliff overlooking the Golden Gate Bridge, where Charlie, realizing that Bumblebee has a greater purpose on Earth, says goodbye. Bumblebee scans a 1977 Chevrolet Camaro and drives away, and Charlie reunites with her family and Memo. Now using his new name, Bumblebee reunites with Optimus Prime. Prime praises Bumblebee for keeping Earth safe as they watch more Autobots arrive through Earth's atmosphere. Meanwhile, Charlie finally finishes repairing the Corvette she and her father were working on, and drives off into the sunset. Grey Griffin as the voice of Arcee, a female Autobot in charge of keeping contact with the capital. Transformers who appear in non-speaking roles include: Ironhide, the Autobots weapon specialist and Starscream, the second-in-command of the Decepticons along with the Decepticon's Seeker Armada, consisting of Skywarp, Thundercracker, and Dirge. Meanwhile, the Autobot supercomputer, Teletraan 1, appears as one of the main computers on the launchpad tower. On February 12, 2016, it was announced that the sixth film in the Transformers series, Transformers 6, was slated for release on June 8, 2018, and it was later revealed that the film would be an untitled spin-off, featuring Bumblebee. On November 11, 2016, Deadline reported that Paramount Pictures was moving forward with the project, with Christina Hodson announced as having written the script for the spin-off; Hodson was one of the female writers Paramount and Michael Bay had hired for the series' "writers room." It was later revealed that Kelly Fremon Craig had performed a rewrite of the script, but was ultimately not credited in the final product. On March 2, 2017, Deadline reported that Travis Knight was set to direct the film. In May 2017, it was revealed that the film's story would be set in the 1980s, and that it would feature fewer robots. In the same month, it was announced that the film's title was then Transformers Universe: Bumblebee. Knight compared working in live action to his previous work in stop motion, and said he treated scenes featuring the robots as if they were animated scenes, making extensive use of storyboards, breaking down the script and planning out all the details. The scene where Bumblebee explores Charlie's home, he described as "trying to get familiar with this unfamiliar world, it was a lot kind of like Sorcerer’s Apprentice". In May 2017, it was reported that Hailee Steinfeld was in talks for the female lead in the film, and she confirmed her involvement later in June. On July 11, 2017, Jorge Lendeborg Jr. joined the cast as the male lead. On July 12, 2017, The Tracking Board reported that Rachel Crow had been cast as well, though she did not appear in the finished film. The following day, more core cast were announced, including Jason Drucker, Abby Quinn, Ricardo Hoyos and Gracie Dzienny, though Quinn ultimately did not appear in the film. On July 22, 2017, it was reported that Pamela Adlon had been cast to play Steinfeld's character's mother. On July 31, 2017, John Cena was added as a lead, with Kenneth Choi and Stephen Schneider set for supporting roles, though Choi did not appear in the final cut. On October 2, 2017, in an interview promoting the home media release of Transformers: The Last Knight, Peter Cullen revealed he would reprise his role of Optimus Prime in the film. On December 11, 2017, it was rumored that actor Martin Short had joined the film's voice roster, though his scene was deleted. On May 31, 2018, Jess Harnell revealed he would reprise his role as the voice of Barricade from the 2007 film and The Last Knight, but the character did not appear in the final product. Principal photography on the film began on July 31, 2017, in Los Angeles, San Francisco, Santa Cruz, Vallejo, and Mare Island, California, and was scheduled to finish on November 16, 2017, under the working title Brighton Falls. Filming concluded six days ahead of schedule, on November 10, 2017. Hailee Steinfeld's single "Back to Life", from the soundtrack, was released on November 2, 2018. The soundtrack was released in December 21, 2018. Bumblebee will be released on Digital HD on March 19, 2019, and on 4K Ultra HD Blu-ray, Blu-ray and DVD on April 2, 2019. As of February 25, 2019[update], Bumblebee has grossed $126.9 million in the United States and Canada, and $332.3 million in other territories, for a total worldwide gross of $459.3 million, against an estimated production budget of $135 million. On review aggregator Rotten Tomatoes, the film holds an approval rating of 93% based on 217 reviews, with an average rating of 7/10. The website's critical consensus read, "Bumblebee proves it's possible to bring fun and a sense of wonder back to a bloated blockbuster franchise -- and sets up its own slate of sequels in the bargain." On Metacritic, the film has a weighted average score of 66 out of 100, based on 39 critics, indicating "generally favorable reviews". It is the highest-rated Transformers film on both websites. Audiences polled by CinemaScore gave the film an average grade of "A–" on an A+ to F scale, while those at PostTrak gave it an 85% overall positive score and a 68% "definite recommend". Liz Shannon Miller of IndieWire gave the film a "B+" and wrote, "...there are many scenes where giant robots fight each other, and in those scenes, you can actually see what's happening. The Autobots and Decepticons toss each other around with slick judo-like moves and blast each other with abandon, and the cinematography and editing hold still long enough to let you enjoy each moment." Peter Debruge of Variety called the film a "quieter, more character-driven Transformers origin story" and wrote that "Bumblebee is basically the movie that fans of the 1980s animated series wanted all along." James Berardinelli of ReelViews writes "Surprisingly, Bumblebee is one of the best escapist films of the season" and "The movie works in large part because of the depth of Steinfeld’s performance. We haven’t seen such a well-realized character in any of the other Transformers movies." Glenn Kenny of The New York Times says the film is "springy yet coherent, not, like previous films in the series, a digital-image blender set on high" and praises Steinfeld’s in particular for her performance. Leah Greenblatt of Entertainment Weekly says John Cena "does get a disproportionate share of the script’s best lines" and although the film is full of sweet ‘80s nostalgia Greenblatt praises Knight for using it "in ways that feel both familiar and somehow fresh." Jesse Hassenger of The A.V. Club praised Hailee Steinfeld, saying, "her screen presence is the best thing about Bumblebee". He compared the film to The Iron Giant, but while finding many improvements over other Transformers films, Hassenger called the film "disappointing in the end, because it's still a careless stretch of blockbusting", giving it a "C+". Simon Abrams of RogerEbert.com is critical of the lack of originality and notes the various tropes borrowed from the films of executive producer Steven Spielberg. Abrahms does not think the film even succeeded on its own merits, and says "There's not only nothing new here, there's nothing convincing either". Bumblebee was nominated for The Razzie Redeemer Award at the 39th Golden Raspberry Awards. On December 10, 2018, producer Lorenzo Di Bonaventura was asked about the future of the Transformers franchise and if the next film would be a reboot and he said "Reboot, I always hate that word because for one, I'm not sure I really understand what it means," he went on to say "We are going to do another big Transformers movie. It is going to be different than the ones that we've done before." He described the process as more of an "evolution", that they had learned lessons from Bumblebee, "There's more freedom than I think we originally thought in terms of what we can do" and he acknowledged that the franchise will make some changes in tone and style, inspired by the film. Director Travis Knight said his goal was to return to animation studio Laika, but later said that he had a few ideas for a Bumblebee sequel. On January 4, 2019, John Cena expressed interest in reprising his role in a sequel. On January 19, 2019, a sequel was confirmed to be in development, due to the film's international box office performance. ↑ "BUMBLEBEE (2018)". British Board of Film Classification. Retrieved December 15, 2018. ↑ "BUMBLEBEE [Re-edited version,2D]". British Board of Film Classification. Archived from the original on January 9, 2019. Retrieved January 9, 2019. 1 2 3 "Bumblebee (2018)". Box Office Mojo. IMDb. Retrieved February 26, 2019. ↑ "Looks Like Bumblebee Is Officially The Start Of A New Transformers Movie Universe". CinemaBlend. February 17, 2019. Archived from the original on February 17, 2019. Retrieved February 18, 2019. ↑ Spiegel, Josh (December 27, 2018). "'Bumblebee' and When an Animation Director Jumps to Live Action". The Hollywood Reporter. Retrieved January 29, 2019. ↑ Campbell, Christopher (December 9, 2018). "Bumblebee First Reviews: Nostalgia-Heavy Prequel Might Be Series' Best Film". Rotten Tomatoes. Retrieved December 10, 2018. ↑ Butler, Tom (December 17, 2018). "Director Travis Knight reveals 'Bumblebee's' surprising connection to Michael Bay's 'Transformers' (exclusive)". Yahoo Movies UK. Archived from the original on January 14, 2019. Retrieved January 21, 2019 – via news.yahoo.com. 1 2 Vejvoda, Jim (December 3, 2018). "Bumblebee Voice Actor Revealed". IGN. Retrieved December 3, 2018. 1 2 Breznican, Anthony (July 13, 2018). "First Look: Bumblebee unveils two new Decepticon muscle cars". Entertainment Weekly. Archived from the original on July 13, 2018. Retrieved July 13, 2018. 1 2 Dyer, James (October 2, 2017). "Peter Cullen Confirmed In The Bumblebee Movie - Transformers News - TFW2005". Archived from the original on October 5, 2017. Retrieved October 2, 2017. ↑ Scott, Ryan (July 23, 2018). "Optimus Prime Is Definitely in Bumblebee Movie". MovieWeb. Archived from the original on July 24, 2018. Retrieved July 24, 2018. 1 2 "Bumblebee (2018) - Official Teaser Trailer - Paramount Pictures". YouTube. Paramount Pictures. June 5, 2018. Archived from the original on June 5, 2018. Retrieved June 5, 2018. ↑ "San Diego Comic Con 2018 - Bumblebee The Movie Panel - Transformers News - TFW2005". news.tfw2005.com. Archived from the original on July 21, 2018. Retrieved July 21, 2018. 1 2 DeLisle-Griffin, Grey (December 9, 2018). "Go watch the @transformers @bumblebeemovie !!! It's SO GOOD! #arcee #BumblebeeMovie #Transformerspic.twitter.com/iHXqdjLUxN". 1 2 3 4 @GreyDeLisle (December 9, 2018). "Go watch the @transformers @bumblebeemovie !!! It's SO GOOD! #arcee #BumblebeeMovie #Transformers" (Tweet) – via Twitter. 1 2 McMillan, Graeme (September 24, 2018). "How 'Bumblebee' Trailer Demonstrates Best of Both Worlds". The Hollywood Reporter. Archived from the original on September 28, 2018. Retrieved September 27, 2018. 1 2 Bailey, Jon (December 9, 2018). "I'm just gonna go ahead & claim these for the @bumblebeemovie toys of the characters I voiced. @transformers #JoinTheBuzz #TransformersSeigepic.twitter.com/Ygw9yDET8e". ↑ Perry, Spencer (February 12, 2016). "2018 Transformers Movie is a Bumblebee Spin-Off Film". ComingSoon.net. Archived from the original on May 20, 2016. Retrieved February 20, 2016. ↑ Fleming Jr, Mike (November 11, 2016). "Paramount Buzzing Over Christina Hodson 'Bumblebee' Transformers Spinoff Script". Deadline. Archived from the original on November 12, 2016. Retrieved November 12, 2016. ↑ Burton, Byron (December 10, 2018). "Hailee Steinfeld Gets Surprise Birthday Party at 'Bumblebee' Premiere". The Hollywood Reporter. Archived from the original on January 10, 2019. Retrieved January 10, 2019. ↑ Davids, Brian (December 10, 2018). "How Hailee Steinfeld Humanized the 'Transformers' Franchise With 'Bumblebee'". The Hollywood Reporter. Archived from the original on January 10, 2019. Retrieved January 10, 2019. ↑ Busch, Anita (March 2, 2017). "Travis Knight To Direct 'Transformers' Spinoff 'Bumblebee' At Paramount". Deadline. Archived from the original on March 3, 2017. Retrieved March 3, 2017. ↑ Optimus, Silver (May 21, 2017). "Empire Magazine Article On Transformers Cinematic Universe – Transformers News – TFW2005". TFW2005.COM. Archived from the original on June 18, 2017. Retrieved June 14, 2017. ↑ Lesnick, Silas (May 23, 2017). "Licensing Expo 2017 - Full Gallery at ComingSoon.net". ComingSoon.net. Archived from the original on July 31, 2017. Retrieved July 31, 2017. ↑ Kroll, Justin (May 31, 2017). "Hailee Steinfeld Eyes 'Transformers' Spinoff 'Bumblebee' (EXCLUSIVE)". Variety. Archived from the original on August 1, 2017. Retrieved July 31, 2017. ↑ "Hailee Steinfeld confirms part in Transformers spin-off". BBC Newsbeat. June 12, 2017. Archived from the original on August 4, 2017. Retrieved July 31, 2017. ↑ Ford, Rebecca (July 11, 2017). "'Transformers' Spinoff 'Bumblebee' Casts Jorge Lendeborg Jr. as Male Lead (Exclusive)". The Hollywood Reporter. Archived from the original on July 13, 2017. Retrieved July 12, 2017. ↑ Sneider, Jeff (July 12, 2017). "Rachel Crow in Talks for Key Role in "Transformers" Spinoff "Bumblebee" (Exclusive)". The Tracking Board. Archived from the original on July 31, 2017. Retrieved July 31, 2017. ↑ Ford, Rebecca (July 13, 2017). "'Transformers' Spinoff 'Bumblebee' Rounds Out Cast (Exclusive)". The Hollywood Reporter. Archived from the original on August 1, 2017. Retrieved July 31, 2017. ↑ Hipes, Patrick (July 22, 2017). "Pamela Adlon Joins Cast Of 'Transformers' Spinoff 'Bumblebee'". Deadline. Archived from the original on July 23, 2017. Retrieved July 24, 2017. 1 2 3 D'Alessandro, Anthony (July 31, 2017). "'Transformers' Spinoff 'Bumblebee' Flies To December 2018". Deadline. Archived from the original on July 31, 2017. Retrieved August 1, 2017. ↑ LOUGHLIN, SEAN. "Steve Martin and Martin Short head to Borgata for an unforgettable evening". Archived from the original on April 17, 2018. Retrieved April 14, 2018. ↑ Anderton, Ethan (January 2, 2019). "'Bumblebee' Made Some Big Changes to Distance Itself from Michael Bay's 'Transformers' Movies". /Film. Retrieved January 25, 2019. ↑ "Jess Harnell Reprises His Role As Barricade For Transformers: Bumblebee - Transformers News". TFW2005. Archived from the original on June 12, 2018. Retrieved May 31, 2018. ↑ Breznican, Anthony (July 13, 2018). "Exclusive: 'Bumblebee' unveils two new Decepticon trackers". Archived from the original on July 13, 2018. Retrieved July 13, 2018. ↑ "David Sobolov on Twitter". ↑ Bay Area News Group (June 6, 2018). "'BumbleBee' trailer released; 'Transformers' spinoff filmed in Santa Cruz". The Mercury News. Retrieved December 21, 2018. ↑ Marc, Christopher (July 23, 2017). "'Bumblebee' aka Brighton Falls To Wrap Filming In November". Omega Underground. Archived from the original on July 31, 2017. Retrieved July 31, 2017. ↑ Kaye, Don (July 27, 2017). "Transformers: Bumblebee starts shooting next week". Den of Geek. Retrieved July 31, 2017. ↑ Wood, Matt (November 12, 2017). "The Bumblebee Movie Just Got A New Title And A Cool 80s Logo". CinemaBlend. Archived from the original on November 12, 2017. Retrieved November 12, 2017. ↑ Frei, Vincent. "BUMBLEBEE". www.artofvfx.com. Archived from the original on November 15, 2018. Retrieved September 24, 2018. ↑ Engelman, Nicole (November 2, 2018). "Hailee Steinfeld Releases Magnetic Single 'Back To Life' From 'Bumblebee' Soundtrack: Listen". Billboard. Archived from the original on November 3, 2018. Retrieved November 5, 2018. 1 2 "Dario Marianelli to Score 'Transformers' Spinoff 'Bumblebee'". Film Music Reporter. May 9, 2018. Archived from the original on May 14, 2018. Retrieved May 9, 2018. ↑ "Bumblebee". Bumblebee film official website. Paramount Pictures. Archived from the original on January 23, 2019. Retrieved January 23, 2019. ↑ Bumblebee (2018) - New Official Trailer - Paramount Pictures. YouTube. Paramount Pictures. September 24, 2018. Event occurs at 02:25. Archived from the original on September 24, 2018. Retrieved September 24, 2018. ↑ "Bumblebee | Nearby Showtime". IMAX. Archived from the original on December 18, 2018. Retrieved December 18, 2018. ↑ Anderson, Jenna (June 5, 2018). "Transformers 'Bumblebee: The Movie' Trailer Released". comicbook.com. Archived from the original on June 12, 2018. Retrieved August 20, 2018. ↑ BUMBLEBEE International Trailer (2018) John Cena Transformers Movie HD. YouTube. Comicbook.com. September 24, 2018. Retrieved September 24, 2018. ↑ Patel, Natasha (December 3, 2018). "Hailee Steinfeld stuns in figure hugging minidress and daring thigh-high boots at Bumblebee photocall in Berlin". DailyMail. Retrieved December 3, 2018. ↑ D'Alessandro, Anthony (November 21, 2018). "'Bumblebee' Will Sneak Into Theaters On Dec. 8". Deadline Hollywood. Archived from the original on November 21, 2018. Retrieved November 21, 2018. ↑ "Bumblebee DVD Release Date April 2, 2019". DVDs Release Dates. Retrieved 2019-02-19. ↑ D'Alessandro, Anthony (December 18, 2018). "'Aquaman' Darting To $120M+ In Competitive Christmas 5-Day Corridor – Box Office Preview". Deadline Hollywood. Archived from the original on December 19, 2018. Retrieved December 18, 2018. ↑ D'Alessandro, Anthony (December 16, 2018). "'Aquaman' Amazon Prime Previews Hook Near $3M Besting 'Jumanji 2'". Deadline Hollywood. Archived from the original on December 16, 2018. Retrieved December 16, 2018. 1 2 D'Alessandro, Anthony (December 26, 2018). "'Aquaman' Unwraps $22M+ On Christmas For $105M+ Cume; 'Holmes & Watson' Opens To $6M+; 'Vice' $4M+". Deadline Hollywood. Archived from the original on December 23, 2018. Retrieved December 26, 2018. ↑ D'Alessandro, Anthony (December 30, 2018). "'Aquaman' Sailing To $52M+ 2nd Weekend; $189M+ Cume Pacing Ahead Of 'Doctor Strange' & 'Guardians Of The Galaxy'". Deadline Hollywood. Archived from the original on December 31, 2018. Retrieved December 30, 2018. ↑ D'Alessandro, Anthony (January 6, 2018). "'Aquaman' Still The Big Man At The B.O. With $30M+; 'Escape Room' Packs In $17M+ – Early Sunday Update". Deadline Hollywood. Archived from the original on January 4, 2019. Retrieved January 6, 2019. ↑ "Bumblebee (2018)". Rotten Tomatoes. Fandango. Archived from the original on December 8, 2018. Retrieved December 26, 2018. ↑ "Bumblebee Reviews". Metacritic. Archived from the original on December 10, 2018. Retrieved December 26, 2018. ↑ Stone, Sam (December 18, 2018). "Every Transformers Movie Ranked (According to Critics)". CBR.com. Archived from the original on December 19, 2018. Retrieved December 18, 2018. ↑ Shannon Miller, Liz (December 8, 2018). "'Bumblebee' Review: The Best Transformers Movie By Far Actually Cares About People". IndieWire. Penske Business Media. Archived from the original on December 9, 2018. Retrieved December 9, 2018. ↑ Debruge, Peter (December 8, 2018). "Film Review: 'Bumblebee'". Variety. Archived from the original on December 9, 2018. Retrieved December 9, 2018. ↑ James Berardinelli (December 24, 2018). "Bumblebee (United States, 2018)". ReelViews. Archived from the original on January 27, 2019. Retrieved January 27, 2019. ↑ Glenn Kenny (December 18, 2018). "'Bumblebee' Review: Finally, a 'Transformers' Movie That's Actually Good". Archived from the original on January 27, 2019. Retrieved January 27, 2019. ↑ Leah Greenblatt (December 17, 2018). "Bumblebee brings charm and heart to the Transformers franchise: EW review". Entertainment Weekly. Archived from the original on January 28, 2019. Retrieved January 27, 2019. ↑ Hassenger, Jesse (December 14, 2018). "Bumblebee may be the best Transformers movie, but does that mean it's any good?". The Onion. Archived from the original on December 16, 2018. Retrieved December 16, 2018. ↑ Abrams, Simon (December 21, 2018). "Bumblebee Movie Review & Film Summary (2018) | Roger Ebert". RogerEbert.com. Archived from the original on January 30, 2019. Retrieved February 17, 2019. ↑ "RAZZ NEWZ - The Razzies!". Razzies.com. Archived from the original on January 26, 2019. Retrieved January 26, 2019. ↑ Topel, Fred (December 10, 2018). "The Next 'Transformers' Movie Won't Be a Reboot, But It Will Be "Different" [Exclusive]". /Film. Retrieved January 21, 2019. ↑ Fred Topel (December 10, 2018). "The Next 'Transformers' Movie Won't Be a Reboot, But It Will Be "Different" [Exclusive]". ↑ Bacon, Cooper Hood (December 4, 2018). "Bumblebee's Travis Knight Says He's Not Directing Guardians of the Galaxy 3". ScreenRant. Archived from the original on January 25, 2019. Retrieved January 25, 2019. ↑ Bacon, Thomas (December 24, 2018). "Bumblebee Director Already Has Ideas for a Potential Sequel". ScreenRant. Archived from the original on January 25, 2019. Retrieved January 25, 2019. ↑ Carbone, Gina (January 4, 2019). "John Cena Would Love To Make A Sequel To Bumblebee". CinemaBlend. Archived from the original on January 25, 2019. Retrieved January 25, 2019. ↑ Tartaglione, Nancy (January 19, 2019). "'Bumblebee' Buzzes Past $400M WW – What's Next For The Autobots". Deadline. Archived from the original on January 23, 2019. Retrieved January 24, 2019.